The Cognitive Code Courier has been discontinued. No direct replacement is available. With its small package, 2.5 ips print speed, and rugged weather resistant case, Code Courier sets the standard for portable printer performance, convenience, and reliability. Code Courier direct thermal and thermal transfer portable printers deliver unsurpassed performance in a surprisingly compact package. With a full suite of on-board barcodes, including high density two dimensional codes, a rich text font selection, and 2.5 ips print speed, Code Courier printers have the power you need for the most demanding applications. 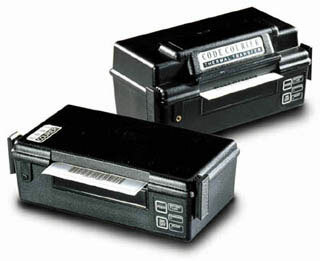 The sophisticated battery management enables the Code Courier to print long after other portables stop. Direct thermal, 203 dpi, 2.5 ips, 4.2" print width, serial interface. Thermal transfer, 203 dpi, 2.5 ips, 4.2" print width, serial interface. 2.0" x 0.56" Thermal transfer vinyl butterfly label. 2,665 labels/roll, 12 roll case.